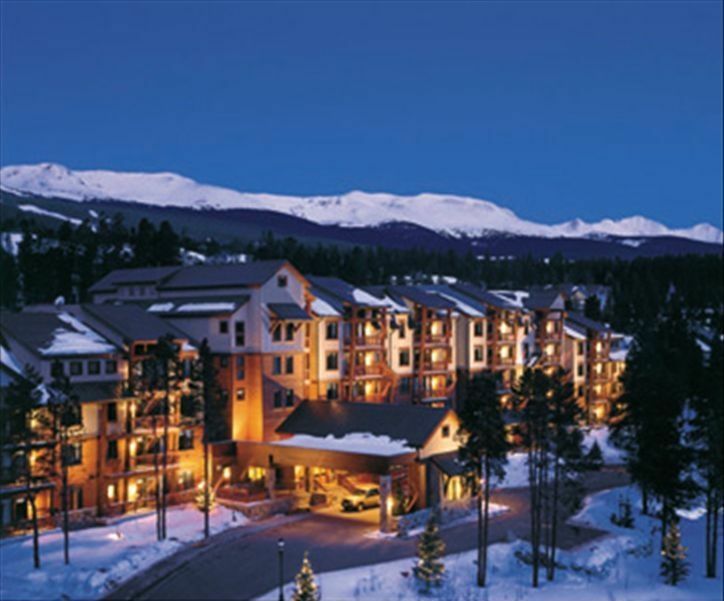 Luxury 2 bedroom unit in a recently developed high end lodge at a premier Colorado ski resort. This condo unit has a balcony, fully-equipped kitchen with polished granite slab counters and Italian ceramic tile floors, and a living room with Rocky Mountain fieldstone gas fireplace and 32” flat screen TV with DVD player. There is also a clothes washer and dryer. The master suite has a king-size bed and beautiful bath with two-person jetted tub, granite slab counter, Italian ceramic tile floors, and separate granite tile shower. The second bedroom suite has two twin beds and a bath featuring a two-person jetted tub. Each bedroom has a 20-inch TV. The cable TV service includes HBO. Resort amenities include concierge service, around the clock front desk service, lounges, recreation rooms, pool and hot tubs, spa services, heated parking garage, etc. In addition, there is complimentary bell service and complimentary shuttle service to any base of the mountain and around Breckenridge. Peak 9 is a half block walk. Boot heaters and ski and snowboard storage is also provided at no additional charge. I have lived in Boulder, CO since 2005. Our home is 2 hours from the property. I am retired. Both bathrooms have shower and tub. Master bath has jetted tub + separate shower. Spa with individual treatment rooms and professional therapists for massage, aromatherapy, European facials and other treatments. Owners lounge and bar with big screen TV, billiards, fireplace and couches. Fitness Center with free weights and exercise equipment. Locker rooms with steam room. Arcade for youth. Ski rental shop. Fabulous Christmas Family Ski Vacation! The Valdoro exceeded our expectations. We rented a nearby condo the year before and decided to try the Valdoro for a ski trip. This property has everything for a convenient ski vacation. From the ski rental shop and ski lockers in the lobby to the free shuttle to the lifts, this place had it all. We really appreciated the hot tubs and steam room. In the morning the shuttle driver will carry your skis from the lockers to the bus. They drop you right at Beaver Run which is a 3 minute drive. In the evening the Valdoro has an arcade and a cozy bar with billiards, chess and a large fireplace. The courtesy shuttle will take guests to dinner or anywhere in town. When we finished dinner we called the shuttle and they pick you up in a few minutes. This is a real perk versus having to walk in the cold or rely on public transportation. The rooms are modern and well-equipped with a fully functional kitchen and lovely fireplace. Our 2 bedroom 2 bathroom condo had a balcony and a view of the snow-capped trees. Several HBO channels are included on TV which is helpful at night. The laundry in the unit was useful. Small packets of laundry detergent are provided. Every morning hot coffee and tea is available in the lobby. The underground parking was very useful in the cold weather. If you are considering booking this property, don't hesitate. You won't be disappointed. Condo was as listed and was perfect for our family of 5. We stayed for a week and the resort made it very easy to get around town without a car. They have a shuttle that will take you to all the places that you need with very little wait. The staff was extremely friendly and very helpful. Condo had everything that we needed with plenty of space. Highly recommend. Great condo - great location! We just returned from spending 4 nights in this condo. Everything in the condo was very clean. Super nice kitchen and great beds. Ceiling fans and tv's in every room. They even have robes waiting in the closets for you. The building has a workout room, game room and spa available. You just have to walk around the corner and you are on Main street for great shopping and restaurants. Very easy booking and great communication from Eugene. I would definitely stay here again. We stayed here for 4 nights. The location was perfect and the views were amazing. The bedrooms and bathrooms were huge. The property was very clean and the staff was very helpful. The owner was quick to respond to my questions and very nice. I am keeping his information for hopefully future rentals and have told everyone about this place. Fantastic! Stayed for 1 week at the Valdoro Lodge with my family. Plenty of room for 2 adults / 2 children. Excellent location in Breckenridge. Condo was very clean and comfortable. The Valdoro staff was extremely accommodating. The Valdoro additonally had a bike rental shop on site. Secured bike cage in the parking garage. Location was close to all the mountain bike trailheads. Thanks Gene for giving us the opportunity to stay there!